The most common questions we receive about NATULIQUE Organic Hair Color are ”is it chemical free?” and ”is it ammonia free?”. The NATULIQUE hair colors are made of certified organic and natural ingredients and 98% of them er derived from natural sources. This means that the ingredients are found in nature and are not produced in a lab or are synthetic. Our Natural Colors have been designed with a focus on natural ingredients but at the same time to give you that long lasting, full coverage, amazing and healthy hair. But what about ammonia? Why is it important for us that our colors are ammonia free? Let’s nerd out some color chemistry! Let us begin my saying, that we are not chemist, so we are giving you the facts are professional hair colorists. We have a lot of experience with in hair coloring because it is our goal to give to you the best, healthiest and safest hair colors! …You can read more about NATULIQUE, our roots and initiatives! All permanent hair colors needs a catalyst to increase pH (alkalize) in the hair. In regular terms, this means that hair colors need an ingredient that opens up the hair so the color can get inside the hair. Ammonia is actually, believe it or not, a natural substance and has been used in permanent hair colors for lots of years. Ammonia typically raises the ph to 10-10.5. However the problem is, that the chemical is very aggressive and irritates the the scalp and on top of that it gives off fumes. The fumes when dissolved in water forms ammonium hydroxide which is highly corrosive. There are many health risks attached to using hair colors containing ammonia and several reports have been filed on ammonia from the Department of Health. the National Institutes of Health, and the U.S National Library of Medicine. Another problem that arises from using ammonia in hair colors for the salon artists is, that due to its aggressiveness causes loss of protein and moisture, and it damages the cuticle. So be careful out there and stay away from colors that are not ammonia free hair colors. But what colors are safer then? Because ammonia is not the only substance option available on the market that serves as an alkaline agent in hair color to raise the ph in order to be able to color hair. 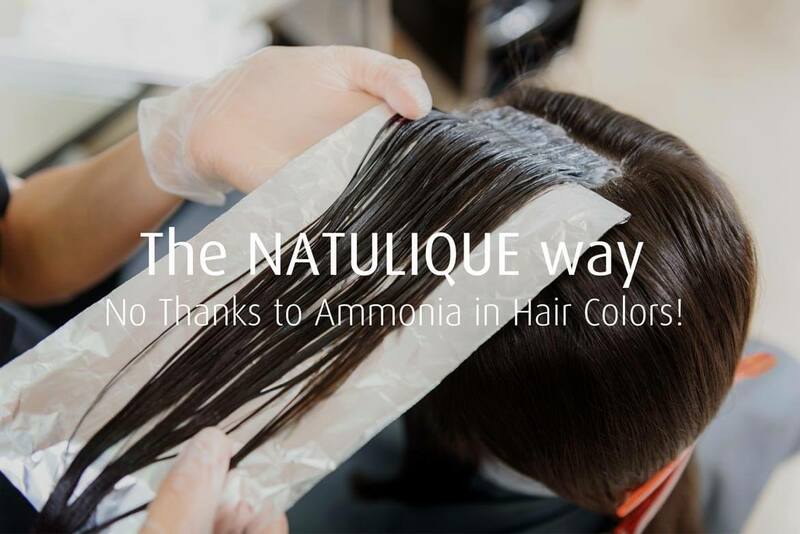 What Does the NATULIQUE Ammonie Free Hair Color Contain? Cocamide MEA is a fatty acid derived from coconut oil. The Cocamide MEA is used as a replacement ph adjuster in our hair colors and they are therefore ammonia free. This makes the NATULIQUE hair colors less volatile and less corrosive. You may have noticed that we keep saying that permanent hair color needs a catalyst. Permanent hair color is any color that can completely cover grey or make the hair lighter. Temporary or semi permanent hair colors do not need to open the cuticle because the color lives on top of the hair for a certain amount of time and then washes away. This means that these hair colors do not contain ammonia either nor do they contain MEA, but they do not last. So lets make this clear: Our hair colors do contain chemicals, but they are 98% natural. Our hair colors are ammonia free, but do contain Cocamine MEA in order to open up the hair so it colors. Everything contains chemicals, but ours are better, safer and healthier for the hair, scalp and for the color artists. Read more about our Organic based Hair Colour and learn more.